Electroconvulsive Therapy (ECT) has been shown to be a safe and effective method of treatment for a variety of psychiatric illnesses, including depression, bipolar illness, and schizophrenia. ECT is commonly recommended for depressed patients who cannot tolerate medication, as well as those whose depression has not responded to other treatments, or those who require a more rapid response than that offered by medications or psychotherapy. In its 70-plus year history, the technique has been stigmatized by negative portrayals in the media, but in reality ECT can be safely and comfortably administered, with favorable results. 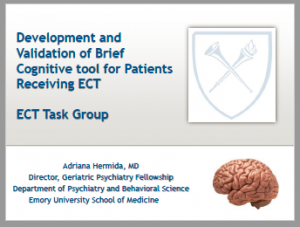 Formed in July, 2010, the ECT Task Group has several broad goals, notably to identify best practices in ECT, to educate practitioners and the general public about the safety and efficacy of ECT, and to advocate for expanding the use of ECT for the treatment of depressive illnesses. 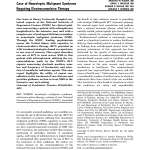 In a relatively short time, the Task Group has realized several noteworthy accomplishments, including fielding a comprehensive survey to assess the current state of ECT across NNDC sites, providing education and counsel to the FDA regarding the de-stigmatization of ECT and the possible reclassification of ECT devices, and collaborating on a Letter to the Editor of the American Journal of Psychiatry regarding viable drug options for use in the administration of ECT. Looking forward, the Task Group is considering developing an electronic ECT registry to study treatment parameters and cognitive outcomes, notably memory. The Food and Drug Administration’s (FDA’s) recent approval of the re-classification of ECT devices represents a clear step forward in the acceptance of this important treatment modality. Click here to learn more about this FDA action and its effects on the practice of ECT in the USA.